The dynamite shack at the big asbestos mine in Thetford Mines, Quebec, just after it blew all to smithereens and made the Richter Scale rock and roll. No, wait---it had to be just BEFORE it blew up, right? What date and day is it, anyway? What’s tomorrow? 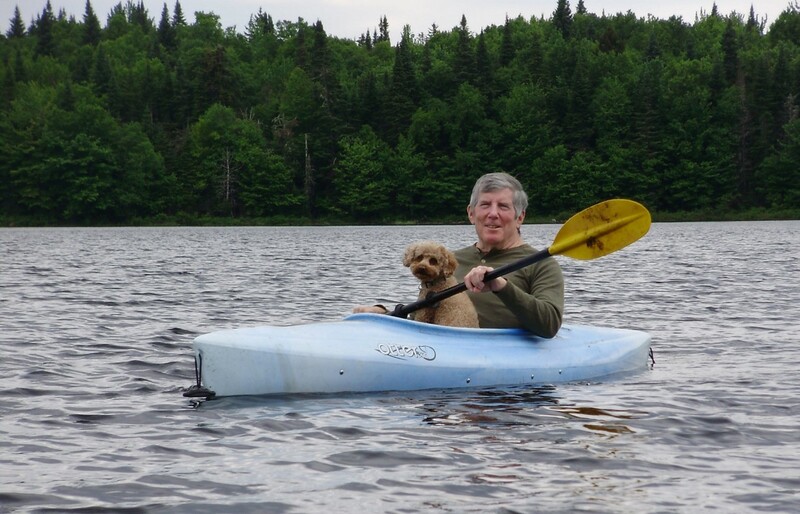 John Harrigan and his attack dog Millie. So, as they are always saying on National Public Radio, about ten days ago, on Monday the 21st, a little bump of an earthquake—one of the milder that New Hampshire has had since the Big One some 350 years ago—rattled teacups, as media types always say, in the Contoocook-Webster area, a little seismic event that would not even have been worth a yawn, save a headline, in California, which really rocks. Which left me wondering, from my perch about 150 miles to the north, within sight of (as Sarah Palin would say) Lower Quebec: Would that be why all the snow slid off my roof at precisely 9:18 that morning, and why I thought the snowplow had just rumbled by? No—Walter Mitty stuff for sure. It was probably the rising sun that made the snow slide, and the rumble really was (yawn) the snowplow. I was probably too far from the epicenter, which turned out to be Warner, a town southwest of Concord, which is the state capital, a small city south of the notches (just to be precise here). Still, southern New Hampshire’s little quakelet sparked personal memories of quakes and tremblors, and of my Southern Tier newsroom days when, because I was somehow the go-to guy for anything smacking of the great outdoors and everything beneath it, including water, buried ice, gold, copper and the shifting of massive plates, I was deemed, by fiat, to be the Earthquake Editor. Fancy title, no increase in pay. Back in those days, I’d call up the Jesuits, who back in the even earlier days when the Pope was carving up the globe and handing out duties to various religious orders, were given the job of keeping track of earthquakes. They are still at it. Go, Jesuits. I still have my contacts and telephone numbers from way back when, and so I went looking for my Jesuit earthquake keepers of old at Weston University, in Weston, Massachusetts, and there was the telephone number right in my ragged old book. It was too much to expect that my longtime contacts there, the genial Fr. Linnehan and Fr. Shea, were still on the terra firma side of Earthquake Heaven, so the best I could hope for was to get someone understanding and genial, always the hallmark of a good Jesuit. Hopefully I would get Fr. Linnehan’s successor, who would say, in a fatherly or brotherly way, something like “Oh, we get these little bumps now and then, like a toboggan going over someone’s lost boot.” This was not to be, however, because nobody at the Weston Observatory answered the phone. Perhaps, just then at mid-afternoon, they were answering a higher calling. New Hampshire’s biggest “recorded” quake (for there were no precise ways of measuring back then) was in 1663, when a major shock struck the Seacoast Area, its epicenter determined by modern-day sleuths to have been somewhere along the St. Lawrence. It was felt all over the Northeast, and in the Massachusetts Bay Colony knocked pewter from mantelpiece s and shelves. Chimneys all over New England were broken and thrown down. I know this last part from the history books, but I also know it because back in the 1970s I did a photo-feature on a brick house in Greenland whose massive east wall brick chimney was cracked by the 1663 quake. The home’s owner, a member of New Hampshire’s far-flung Weeks family, perhaps whose ancestors were the progenitors of all of the Weeks families so widely flung statewide, even the Winnipesaukee and Lancaster Weeks families, graciously led me inside for a tour. And there it was, a big wide crack right in the east chimney, for sure. “Hmmm, that’s a pretty big crack,” was about all I could think of halfway intelligent to say. It was too feeble to remark on, say, rattling teacups. My other personal history with earthquakes occurred in 1954 when, at the age of 7 and visiting my mother’s parents in Concord, I was thrown out of bed by an earthquake. This has made a good story all my life, and whenever the subject has come up, say right after an earthquake has shaken all the fillings out of everyone’s teeth in Japan, I’ve been able to “Up close and personalize it,” as ABC Sports would say, and jump in with “You know, when I was seven a big earthquake threw me right out of bed in Concord,” and people would roll their eyes and look for the exits. Sadly, my boyhood bubble burst when I looked at the actual list of actual earthquakes in New Hampshire, available from the U.S. Geological Survey’s amazingly good web site, and learned that there was no record of any earthquake in the Concord area when I was seven, not even when I was six or eight, even ten. Maybe it was an unusually heavy snowplow. In the late 1970s and all through the 1980s, a bunch of us numbering four to 14 made annual fall trips to Sept. Isles (Seven Islands), far up the north shore of the St. Lawrence, and thence, the next morning, far up through northern Quebec and southern Labrador by train, to be hurled off (two minutes to get all your gear off) at the Menihek Rapids. 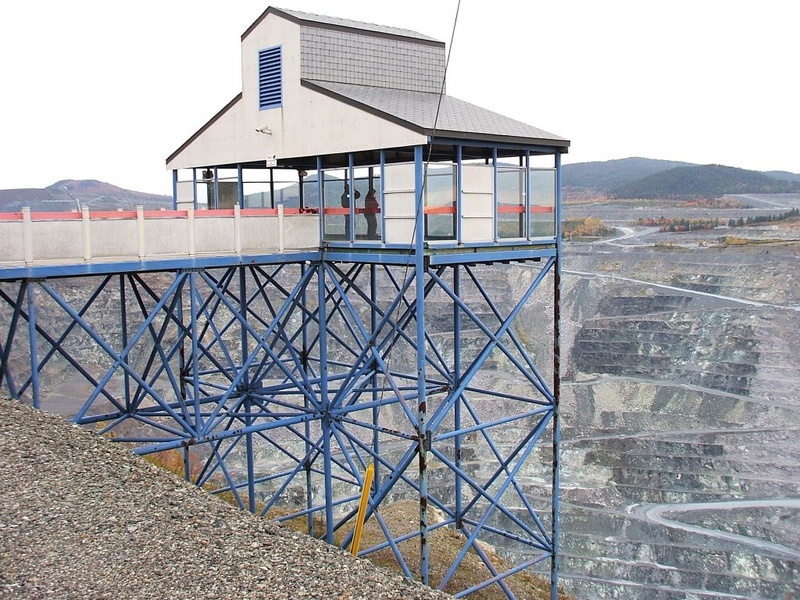 On the way up through Lower Canada to Levis, to take the ferry across below the Citadel at Quebec, we passed by the giant asbestos pit at Thetford Mines. We usually stopped there to gaze own into the huge hole in Mother Earth, where trucks the size of houses crawled around like Tonka Toys. One day, while I was lolling around in the newsroom at the New Hampshire Sunday News, conjuring up the next Walter Mitty excuse for a story, word came over the Associated Press wire, one of those little items you see under “News Tidbits from Around the Hemisphere” or something, that a dynamite storage shack had blown up at Thetford Mines. In fact it was THE dynamite shack, a biggie, and when it blew it knocked people, mules and chickens silly for miles around, and rattled Hummels and other annoying figurines off shelves as far away as Sarah Palin’s summer camp on the Kamchatka Peninsula.